Asics Short Sleeve Mens tshirt large. Dispatched with Royal Mail 1st Class. Excellent condition. As new to be honest worn a handful of times . ASICS MOTIONDRY SS SEAMLESS TOP. Running Level 2. RRP 24.99. 76% Polyester 24% Polymide. Constructed in polyester, this piece is super lightweight and soft, making it an easy style. Other features include a crew neck and short sleeves styled with red stripes. 100% Cotton. Machine washable at 30 degrees.Ref 1308030904. Motion Dry Essentials Running Top. Short Sleeves. 100% Polyester. Size - Extra Large. 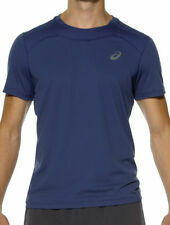 Men’s Asics Carl S/S T shirt. Size Large. Lime green/Black. Brand New with tags. It is in 50% cooldry and 50% polyester. 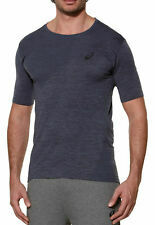 ASICS dark grey men’s sport performance top.